Our close-knit team of chiropractors, massage therapists, and physical therapists work hand in hand with each other and with YOU to make your life better! However simple or complicated your concerns may be, Dr. Ibolit Chiropractic, Physical Therapy & Massage can help. We use only evidence-based treatment that’s grounded in research. A chiropractic adjustment is one of many tools that we use to take care of you. Our doctors focus on techniques that we know will help you recover from injuries and every day stresses affecting your body. Your session with the chiropractor might be a standalone adjustment, or it may be part of a broader scope of treatment. Whatever it is, we’ll be sure to explain what we’re doing and why we’re doing it. We don’t only want you to leave us feeling better, we want you to leave with your questions answered. Learn how physical therapy can utilize chiropractic treatment for better results. Whether you’re experiencing pain or loss of movement from a new injury, car accident, or you’ve been suffering from pain and movement limitations for years, the presence of pain causes your body to become caught in a loop of immobility, strength imbalances and faulty biomechanics. 1. Immobility takes over after inflammation, swelling and muscle tightness set in. 2. Strength imbalances come after the body compensates for immobility. 3. Faulty biomechanics such as slouching or bending wrong, make problems worse. With fresh injuries, or old problems coming from years of sitting or bending wrong, the only way to escape the cycle of pain and loss of motion is by dealing with the source of these problems bubbling under the surface. 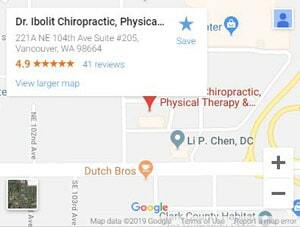 Our chiropractic care is part of a multi-prong effort and the collaboration of many healing fields to take care of you and get you back to your life! Chiropractic care can provide immediate pain relief and allow you to move better, but massage therapy physical therapy, and thoughtful exercise are what produce lasting results. We want to be able to give everybody all three. How Are You Moving Wrong? To take care of you well, we need to look at your spine and its relationship with your everyday movements and postures. Your body is a complicated machine made of many parts. It may not always be clear how one joint, imbalance or bad habit can affect another part of the body. 1. What led to the injury? Was it a car accident or is it because you get out of bed funny every morning? 2. How is your injury changing the way you sit, drive, hold your phone, or get in and out of bed? 3. How can we make an injury like it never even happened? There can be a lot of questions surrounding an injury and our team has the expertise to get them answered. Our collaborative and thorough approach to treatment means our patients don’t have to wait long for results. For restorative chiropractic care, come in for an appointment today.